Research guide for the Battle of Yorktown Staff Ride. "On October 19, in a spectacle incredible to all who witnessed it, most of Cornwallis' army marched out of Yorktown between two lines of allied soldiers--Americans on one side and French on the other--that stretched for more than one mile. 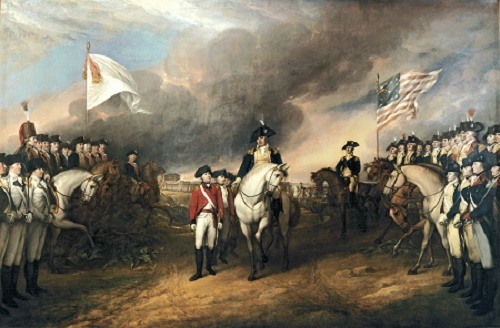 The British marched to a field where they laid down their arms, and returned to Yorktown. They did not know that on that very day, Clinton sailed for Yorktown from New York with 5,000 troops."